Two weeks. That’s it. Only 13 days until I receive my MRS. It’s so strange that it’s literally around the corner, and it hasn’t hit me just yet. Granted I have to get through a week of school, clinic, a Junior League meeting, a quiz and a plane ride home before I can really think about the walking down the aisle. Not to mention a family emergency this past week caused me to consider postponing the already too-long engagement. It also caused me to consider a lot of other things: the importance of family and God and the lack of importance of centerpieces and chair covers (though, if budget allows, I’d still really love chair covers). In a blink of an eye, the dress dislike and my fear of crappy centerpieces disappeared. God, love, and the strength of family took their places. And I have to say, that I have the best fiancé in the entire world. Though a few states away, he sat silently through my crazy crying spells and made sure to end every conversation on a positive note. He never questioned what was happening, but instead gave me support and encouragement. Through this I have discovered what is really important in this wedding, and much to my mom’s disagreement, it’s not the cake. It’s the relationships that are being strengthened (with my parents, with my brothers and with Mark) and those being formed (between our parents, between our brothers, with our in-laws). Okay, well with all the sentimental and learning experiences out of the way, I will get right down to my chief complaint: the freaking cost of “wedding.” I wasn’t ignorant enough to believe I could actually stay on budget. However, I do not believe in paying for $75 for three orchids on a cake. Yes. $75. I can pick up two orchid plants for $20 on any corner of US 1 in Miami. And wedding cake. It’s flour, butter, water and some flavoring. Hopefully it’s infused with gold for the amount we are paying for it. We don’t have an elaborate design either (though there will be edible glitter involved). 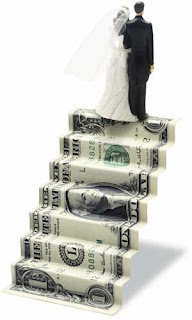 Weddings have a way of distorting our perception of money. I remember how quickly my commitment to being a reasonable and frugal bride turned into justifying $400 hair pieces. It's insanity, really. I'm glad that you have been able to focus on the meaning behind all of this madness and appreciate your family and soon-to-be husband. I hope that the next two weeks pass quickly - but not too quickly!